Raising dairy goats is a lot like raising a herd of toddlers. They are loving, easily distracted, determined (oh boy are they determined! ), curious, and ALWAYS ALWAYS HUNGRY. 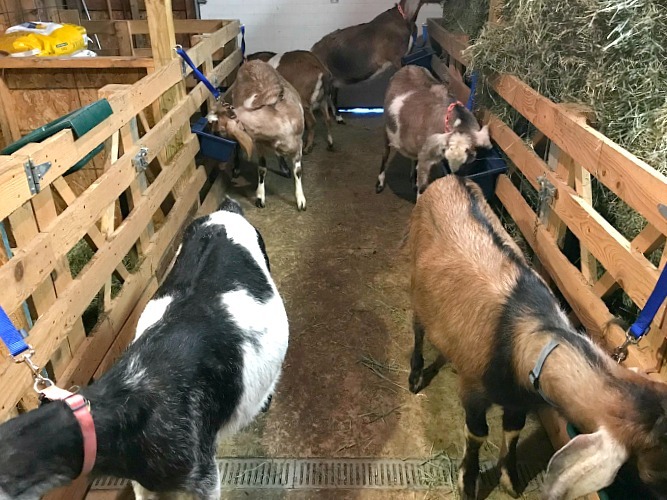 Whenever I went into the main pen to feed my little herd, I was pummeled by hungry rowdy goats that were understandably excited by the food I was carrying. I realized very early on that by feeding this way certain unruly goats got most of the food as they ran from bowl to bowl gobbling things up just as quickly as they could. This was an even bigger problem if I needed to add herbs or other medications to a certain goat’s feed. I knew I needed to find a way to feed better. One day while playing on the internet I stumbled across the site called Fiasco Farm. As I was reading through some of their articles I saw their unique feeding system. They actually pulled all of their goats out of the main pen, hooked them to a rail and fed them each separately. Each dairy goat stood patiently and politely tethered in their spot waiting for their food. I was completely amazed at how well those dairy goats stood there waiting patiently to eat. It was just a photograph however and without a step by step guide on HOW to do this system I quickly left and forgot about it. 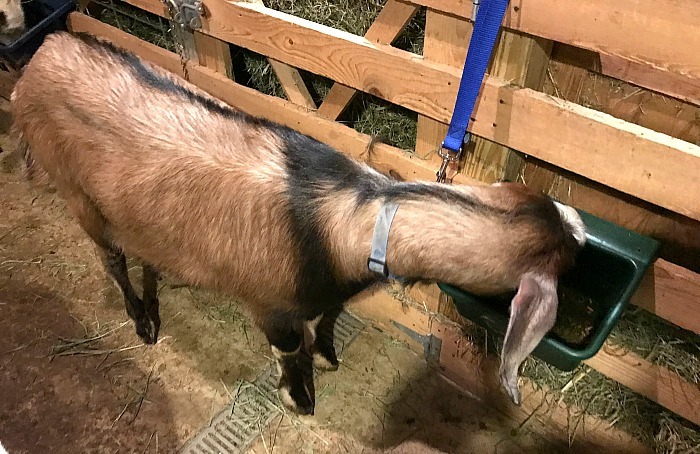 As I began to rely more and more on herbal nutrition for my animals it was important for me to find a way to feed my dairy goats independently. This year I revisited that site and told myself I needed to figure out how to feed this way and teach my rowdy dairy goats to eat this way. Little did I know that it would be so much easier to do that I thought! The most important part of this tethered goat feeding system is to choose a spot that will work for feeding this way. Understandably it will be different depending on your set up but I do think you can make pretty much any arrangement work. Our barn is a shed that we converted into a fully functioning barn with a center section of stalls and two communal herd pens on each side. I use the center area for birthing, kidding, quarantine, and sick care. It is on concrete and easy to keep neat and clear, free from obstacles. I found that the fewer distractions when training my backyard goats the easier it is to acclimate them to a new routine or system. 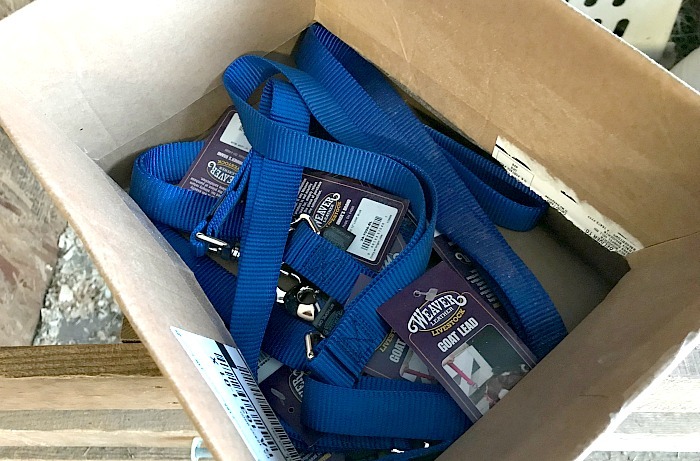 I was able to find goat leads like these for a good price through Jeffers.com. Each lead is 12 inches long with a spring loaded clasp on the end. I believe I paid less than 4 dollars for each. No matter what goat tether you choose make sure it is made of a durable material so it will safely and securely hold your goats. I knew I wanted and needed something pretty secure and stable. 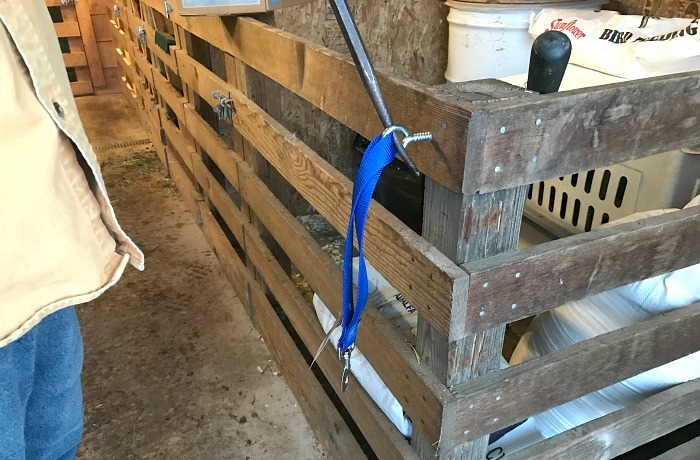 I wasn’t sure how my dairy goats would react to being tethered since they had never been tied in any way before. I had to make sure I had a way to do this without risking injury to me or my goats. A steel eyebolt of 1” worked perfectly. We chose a height that was comfortable for each of our goats and spaced the leads far enough apart so that one goat couldn’t bother another while they were eating. 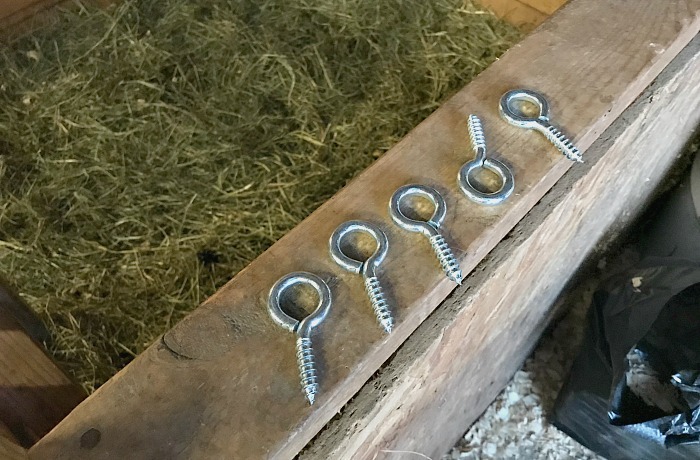 To make screwing in the eye bolt easier we drilled a small starter hole at each site first. Our eye hooks needed to be stretched just a bit to allow us to fit the canvas trap of the tether into the hook. This we easily did using a vice and a steel grow bar. Make sure you only move the opening enough to fit the lead in. If you open it too much you risk the lead coming out during feeding. Continue drilling holes, screwing in eye bolts, and attaching all your leads. Remember when tethered or tie feeding your goats is to be aware of your spacing in both your height and distance. You do not want any tension on your leads that will in any way frighten your goats. Once you lose your goat’s trust it will be tricky getting it back. Hubs being the perfectionist that he is, insisted that all eye bolts face the same way so we needed to use a crowbar to do it. If you do not normally work with your rowdy goats then they will naturally be a bit hesitant the first time you walk them out. Do not lose your patience or your cool. If you keep calm; then your goats will do the same. Fill each feed bowl and label it so you know which bowl goes with whom. Set up your first goat’s feed bowl and go get your goat. Walk them calmly to the first station. Once they are there and have settled in to eat you may then attach the lead to their collar. Ninja tip: If you don’t use collars on your goats you can find safe break-away collars like the ones I use here. These are surprisingly heavy duty yet will break if a goat is caught in a dangerous situation. After your first dairy goat is settled you can place the next feed bowl in place and go get your second goat. Notice I did not put all the feed bowls out at once. This will keep your goats from getting confused and distracted. Continue retrieving goats and setting them in the correct spot until all of your goats are eating. Once everyone is settled and calm, do not leave. Stay with your goats for at least the first few days. If someone gets spooked you will want to step in right away so a dangerous chain reaction does not begin. I just walk over pet and sooth the goat until they are back to eating again. 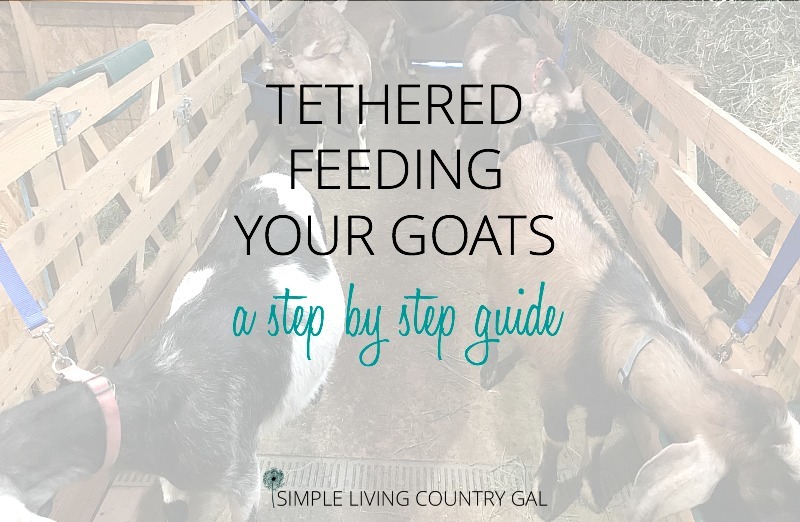 Now, for me and my stinker goats, this is the tricky part of tethered feeding goats. They are curious things and want to stay out and explore this new area of the barn. I have a small number of treats (for my crew it’s banana peels) that I give them in once they are back in the main pen. Now they know if they want a treat….they must go back. And that is all there is to it! You will be surprised at how quickly your dairy goats will learn what is expected of them. If food is involved they will more often than not listen. If you find your dairy goats are not quite getting it, don’t give up. Keep leading, keep working, and keep encouraging. Before you know it they will walk themselves right on over to their feed bowl with no issues. I do not suggest doing this feeding system with large goat bucks or overzealous goats that might possibly hurt you or themselves. Use common sense and work with goats that have a temperament that will allow them to learn without risk of injury. Safety should always be a top priority when raising livestock. 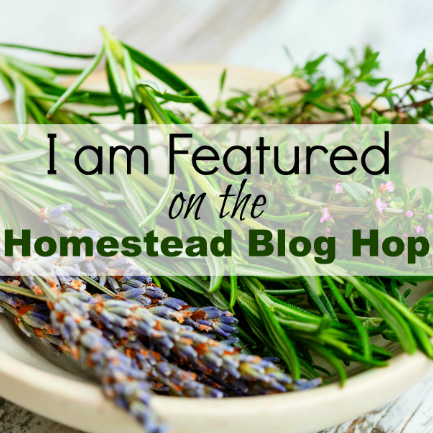 Think and plan and you will set yourself and your homestead up for success. 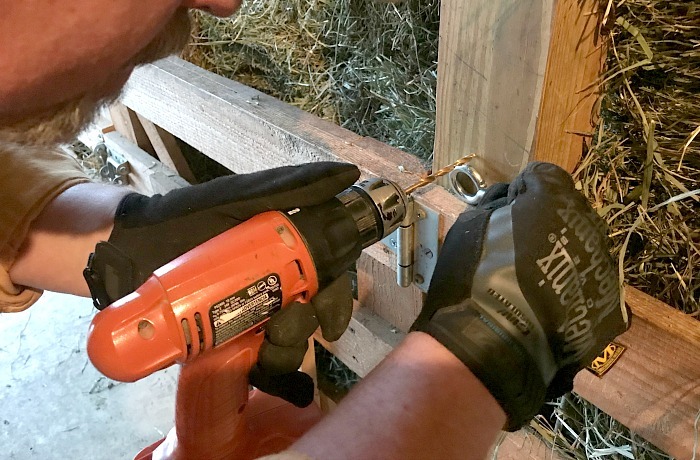 Whether you are brand new to dairy goats, are a backyard goat owner, or want to get started with goats having a loving and hands on approach is always best. Work with your goats from day one and teach them that you are the one that feeds them and the one your goat herd needs to trust. Raising dairy goats is such a fun and rewarding experience! I encourage you to read up on goat raising and all the basics before you begin. Fresh milk on a goat farm is a wonderful way to feed your family delicious and healthy milk, with just one or two goats you can fill your home with milk, cheese, butter and so much more!